I didn't expect this to happen (ever), but when I posted a list of things last week and called it Stuff and Things, a revival began. Next week, the link-up will be posted again! For the first time since April, Joey and I are really feeling that we need to spread the message of *real* blogging. Not fake, not hashtags, not clicks, not sponsorships. Just thoughts and sharing. Which is why we (or most of us) started this thing in the first place. Because from thoughts and sharing comes community. And community is why we STAY in it. Sponsorships, my dear friends, do not create community. Read Joey's thoughts on S&T here. All this being said, Stuff and Things has no rules! Link up your post each Thursday and click around to find *your* community. I found so many blog-friends through link-ups. There's power in that html code, I tell you. +Recommend a vacuum please. Ours is dying. I'm getting a new one this weekend. +Last week, I was hit hard by plantar fasciitis. I first got this when I was student teaching and it was awful. It gets me now maybe once a year or so. It doesn't seem to matter what shoes I'm wearing. Stomping around a classroom all day, after a period of not doing that for awhile, usually does it. Also, I've been wearing my rubber boots on my walks (stomps?) through the field for the last few months (snakes and all, remember? ), so that can't be helping. The only thing that seems to make it better is elevating my feet and taking Aleve. Nikes feel good, but I can't exactly wear those to work. 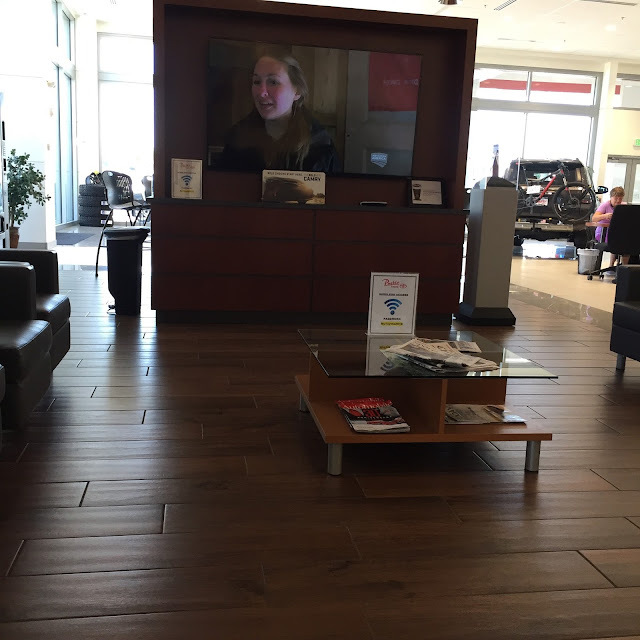 +I was hanging out at Pueblo Toyota the other day and they had Buying Alaska on the giant TV. I felt a (small) tug on my heartstrings. I could tell they'd probably filmed in early spring and I could almost smell the snow and feel the sun that never actually warmed anything, but did a nice job of blinding you. It was annoying the way the show portrayed things. These people were looking for a place off the grid and, while possible in that part of the state, the TV show neglected to mention that there's a Target and Walmart within 90 minutes. Definitely not convenient, but still. Also, with that particular couple, I'm pretty sure that's what Scott aspires us to be. With me willing to live off the grid and use an outhouse and all. They were just married and, sure, we moved to Alaska as newlyweds too. But I had our wifi hooked up within a week. +Speaking of...today is our 8 year dating anniversary. Time flies. 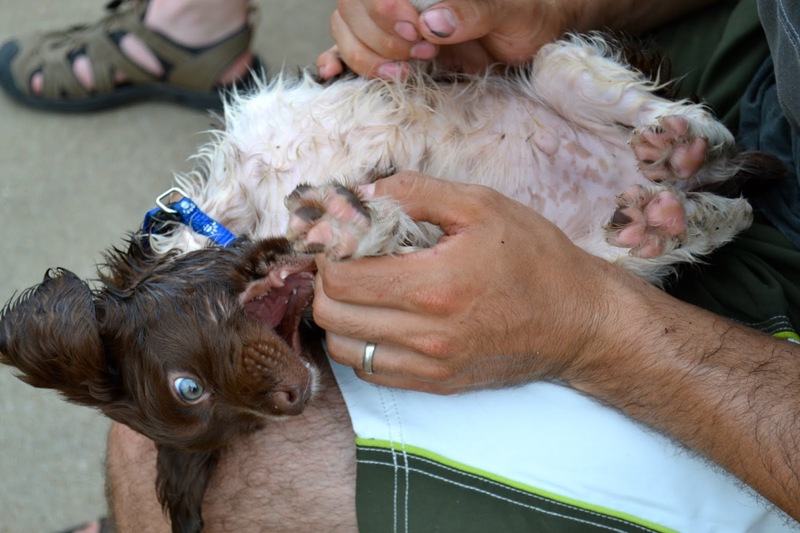 +I found these pictures of Scout the other day when I was looking for a particular photo from 3 years ago. Ugh. I want another one. Mark your calendar! 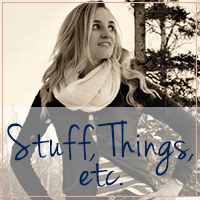 Stuff and Things is coming back next Thursday, September 8th! 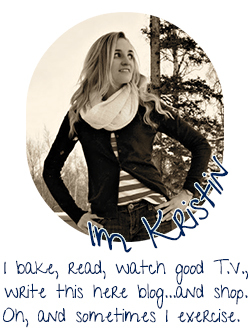 Also, linking up with Kristen and Gretchen. Nope, sponsorships do not a blogging community make. Sorry about the foot thing, that doesn't sound like much fun at all! Sorry to hear you're suffering from plantar fascitis. I use insoles in my runners (not prescribed orthotics but these: https://www.amazon.com/Superfeet-Premium-Shoe-Insoles-Green/dp/B0032ALZL8)...they help A LOT with any foot pain. I hope it gets better soon though!! We have a Dyson vacuum and I swear by it but it was expensive!! Yay! I only ever sporadically linked up, but when I do, I was always happy to do so. 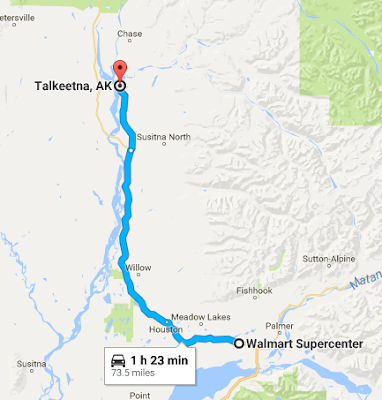 I love that you included the map to show where Walmart was. Happy dating anniversary! I'm so happy the link up is coming back! Since my long-awaited return to blogging (ha ha ha) I've noticed that there is a severe lack of "real" blogs out there these days. And to be honest, I'm hoping to find some non-mommy bloggers for once. I feel like everyone and their sister had a baby in the last two years. This is the vacuum we have and I love love love it, it does carpet and hardwood/linoleum equally well and I like that there's a detachable hose so I can get under/on top of furniture, etc. Definitely shop around if you pick this one though, when we bought ours it was only $150 on Amazon and now it's $200 for some reason. You could probably find a better price elsewhere. Scout as a pup...adorable! I want a new puppy sooo bad & I think my dog (Lab) would love to have a friend. As for a vacuum, not sure if your dogs shed a lot but between the Lab & cat fur, I love our Dyson Animal! Oh girl... I feel you pain about the plantar fasciitis. I have dealt with it for the past decade or so. I quit wearing think soled shoes and started wearing Birkenstocks and sneakers to work along with taking anti-inflammartories and icing my feet. I wish ya the best of luck. I know how much of a booger PF can be. Looking forward to you S&T link up again! I have watched way too much Tiny House Hunters lately and I've learned all about composting toilets. Off the grid is NOT for me! Also - real blogging. It comes in many forms and I love a good bulleted list, but I love paragraphs, too. I wrote my first "real" post in a while today and it's hard not to feel like I did it wrong since it seems like no one cares. But, it rolled around in my head and I felt good getting it out,so that's what should matter, right? you need another one! haha. baby scout just tugs at my heartstrings. yay i am glad you are bringing the link up back! i will definitely join in the week after next, i won't be blogging on holiday. i agree with everything you said about sponsorship do not create community. 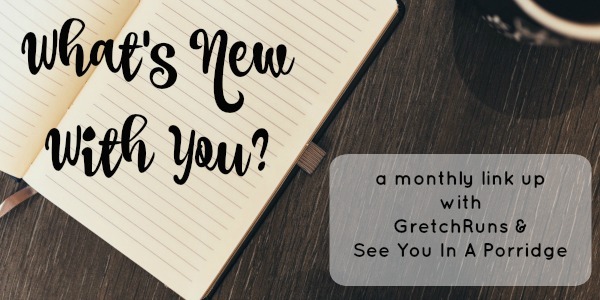 when i first started blogging, i had no idea what kind of community was out there, or that i really didn't want to be a 'big' blogger. i'm glad i got into it, even if it turned into more than i thought (and less, but i am glad!). i have a bissel i think? it works well enough, fabulously on carpet, crappy on hardwood/laminate, which i guess might be normal? if i was a billionaire i might buy a dyson. Panasonic canister vac! I hated canister vacs but it's awesome with dog hair. 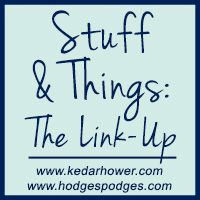 I'm awful with weekly link-ups every week, but I am certainly happy that Stuff & Things is coming back because I foresee myself participating often. 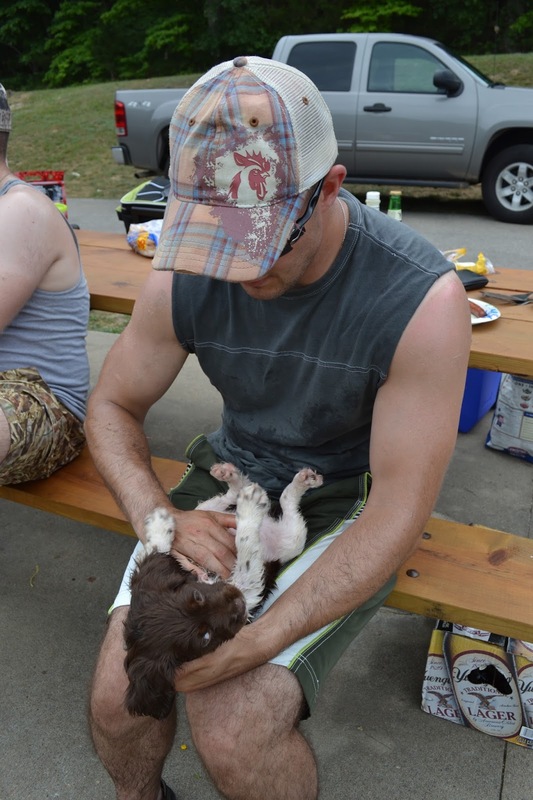 Those pictures of Scout are too cute for words. Happy anniversary! Dan and I just celebrated our 5 years of dating yesterday...I can't believe it's been that long! I have a Shark vaccum cleaner that I absolutely love..you can clean the filter so it never gets clogged and it's really light weight. Good luck finding a new one! Happy anniversary! I would consider being that far from a Target or WalMart totally off the grid, but maybe that's because I've never lived more than 2 miles from both of them! My husband says he would LOVE to live in the wilderness. With nothing. I am a girl who likes to be right in the middle of civilization with all modern amenities at my fingertips. So we go camping a few times a year and call it good! :) Hope your foot feels better soon, that's the worst!